Thanksgiving is almost here. Which means it is time to choose the outfit you will wear to the dining room this year! If you need some inspiration, we are here to help. Below are our personal favorite top five outfit choices! Whether your Thanksgiving festivities call for velvet kimonos and silky blouses or soft sweaters and cozy cardigans, we have you covered! Make the day shine with rich jewel-tone colors, and fresh gold jewelry. Click the titles below the images to link to each item shown. This kimono has some silk content for a luxurious feel. Made in the USA and available in three colors. We love the sparkle of the deep sapphire blue with gold jewelry. For a more casual Thanksgiving Day that possibly involves some outdoor activity, we choose this super soft, warm sweater layered with our vintage French army jacket. Keep the look special-ocassion-apropriate by adding personalized accessories. This outfit rides that thin line between casual and dressy but it is certainly comfy! The silky, olive green blouse layer elevates the cozy choice of this camo cardigan. Viola Earring with Smokey Quartz Stones available through our showrooms. Shop a similar earring HERE. 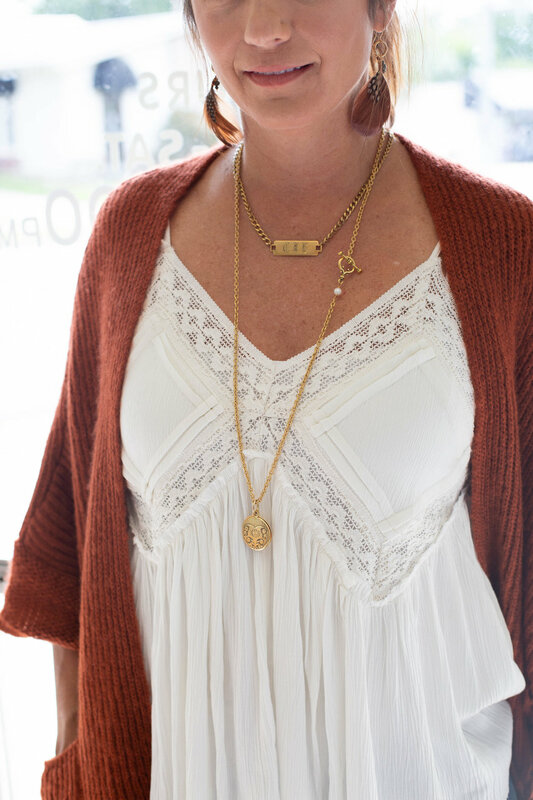 This cardigan and lace cami combination is just one of our favorite looks of all! Wear the cardigan to Thanksgiving, then again next month to a casual Holiday affair.